Breaking the mould of tradition, this truly exceptional extended semi-detached home is not only situated in the most perfect setting but has been extended and finished to a standard that is hard to beat. Every aspect of family living has been thought about when renovating this property and it is our absolute pleasure to be able to offer this property to the market. The current sellers have transformed this home into a modern classic where the internal accommodation has it all… space, natural light flooding into every corner of every room, versatile accommodation and part underfloor heating. Upon entering you are greeted with the hall which has doors opening into the kitchen/dining/family room and lounge. 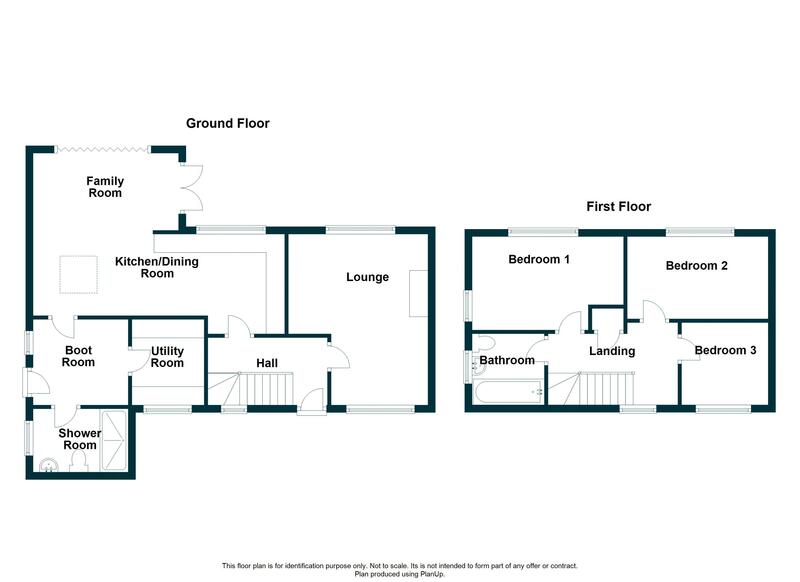 The open plan living accommodation to the rear has been extended to offer a versatile space; the perfect environment for social living with lovely dining and living spaces, completed with bi-fold doors that open out onto the rear garden. From the kitchen area a door opens into a useful boot room, with great storage space, and then on to the utility room and modern shower room. The lounge offers a peaceful and relaxing space with that all-important feature fireplace and windows to the front and rear elevations, allowing the room to be flooded with natural light. To the first floor there are three bedrooms, all of which are doubles, whilst the family bathroom has been fully tiled and re-fitted with a modern white suite. Outside there is plenty of off-road parking to the front, whilst the remainder of the front is laid mainly to lawn with attractive yet low maintenance borders. The rear garden really is every family’s dream; having been fully landscaped and with views over open farm land this is the perfect tranquil environment to enjoy those late summer evening. Properties like this don’t come to market often, so we advise a hasty approach to avoid any disappointment. Great Barrow is a sought-after village community conveniently located just off the A51 and approximately 6 miles from Chester. Easy access is available to the M56 and the motorway network via Junction 14. The A55 to North Wales is easily accessible, and both Liverpool and Manchester Airports are within easy reach. Local amenities include a primary school, The White Horse Public House, Church, social club, bowls and cricket club and a playing field. There are also numerous golf clubs in the area. Wooden entrance door with frosted inset windows. PVC window to the front elevation. Staircase rises to the first floor. Wood effect laminate flooring. Radiator. Telephone and power points. Ceiling light point. Internal doors lead into the lounge and kitchen/dining/family room. A dual aspect room with PVC windows to both the front and rear elevations. Feature fireplace with space for a log-burner set on a stone tiled hearth. Built-in storage unit to the side of the fireplace with shelving and cupboards. Radiator. TV aerial and power points. Coved ceiling and two ceiling light points. The kitchen is fitted with a comprehensive arrangement of wall and base units, incorporating drawers and cupboards. The work-surface houses an inset double porcelain sink with drainer and mixer tap. Power points to the work-surface area. Integral Hotpoint dishwasher. Space for a range cooker with extractor hood over. Space for larder style fridge-freezer. Wood effect laminate flooring. Recessed spotlights. PVC window to the rear elevation. The kitchen opens directly into the family room. PVC French doors open out onto the side elevation, and PVC bi-fold doors open out onto the rear garden. Velux roof window. Wood effect laminate flooring with underfloor heating. TV aerial and power points. Recessed spotlights. Internal door leads into the boot room. Composite door with inset windows to the side elevation with PVC side window. Hatch provides access to loft space. Wood effect laminate flooring with underfloor heating. Power points. Ceiling light point. Internal doors lead into the downstairs shower room and utility room. Fitted with a range of wall and base units with roll-top work-surface over. Space and plumbing for washing machine and space for dryer. Tiled flooring with underfloor heating. Power points. Wall mounted Worcester combination boiler. Ceiling light point. PVC window to the front elevation. Fitted with a white three-piece suite to include a fully tiled double shower cubicle with mixer shower and sliding glass doors. Dual flush WC. Square pedestal washbasin with mixer tap and slate tiled splashback. Underfloor heating. Extractor fan. Recessed spotlights. Frosted PVC window to the side elevation. PVC window to the front elevation. Hatch provides access to loft space. Built-in storage cupboard with fitted shelving. Power points. Coved ceiling and ceiling light point. Internal doors lead into the three bedrooms and bathroom. PVC windows to both the side and rear elevations. Radiator. TV aerial and power points. Coved ceiling and ceiling light point. PVC window to the rear elevation. Radiator. Power points. Coved ceiling and ceiling light point. PVC window to the front elevation. Radiator. Power points. Coved ceiling and ceiling light point. The bathroom is fitted with a white three-piece suite to include a panelled bath with mixer tap, additional shower attachment and glass shower screen. Dual flush WC and washbasin mounted onto a vanity cabinet with storage cupboards beneath. Majority tiled walls and tiled flooring. Extractor fan. Heated towel rail. Recessed spotlights. Frosted PVC window to the side elevation. The property is approached via a double-width gravel driveway providing off-road parking for two vehicles side by side, and gravelled path to the front door. The front garden is laid mainly to lawn with established borders incorporating shrubs and trees, and hedgerows to the boundaries. A pedestrian side gate provides access to the rear garden. The rear garden enjoys extensive views over open farmland and benefits from a paved patio seating area with steps leading up to a raised lawned area. There is hardstanding for a shed and the garden is fully enclosed with panelled fencing. From Chester - proceed out of Chester along the A51 Tarvin Road passing through Boughton and Vicars Cross. Pass the Shell garage on the left hand side and at the junction with the outer ring road continue straight over, out of the city, in the general direction of Tarvin. Pass Vicars Cross Golf Course on the left hand side and continue along into open countryside. Upon reaching the traffic lights at the junction with The Stamford Bridge public house, turn left signposted Great Barrow. Continue along this road for some time into the village, passing the cricket club on the right hand side, You will soon see Broomhill Lane on the right hand side. After a short distance on this lane the property will be seen on the right hand side and clearly identified by a Carman Friend for sale board. View or download the Energy Performance Certificate for Broomhill Lane, Great Barrow, Chester.